Is Google actually building its own cars? Self-driving cars have a promising future, and leading the pack technologically is Google, now a household name that has long transcended its status as a search engine. First and foremost, Google is a technology company and its interest are aligned with anything cutting edge, whether it’s information technology or hardware (smart homes, smart appliances, cars). Since 2011 when Google first showcased its extremely successful self-driving Prius, later switched for a Lexus, the company has been making rapid progress. But Google rarely experiments just for the sake of it. Part of its philosophy is turning disruptive technology into a product, get it out to the people. But how do you go about self-driving cars, considering the auto business is one of the riskiest in the world? Well, just like it did with the Android for smartphones, Google could partner with the leading automakers supplying the technology. Indeed, Google confirmed this January that it had talks with General Motors, Ford, Toyota, Daimler and Volkswagen. But some highly interesting documents gathered by The Guardian suggests a possible alternate route. Google might actually build its own cars, all from scratch. According to The Guardian report, Google Auto LLC is now headed by Chris Urmson, project lead for Google’s self-driving cars. The company was first formed in 2011 as a limited liability company, most likely out of legal considerations. In time, ambitions may have shifted. After Urmson was announced as the new Google Auto lead this May, the company announced it was going to build 100 prototype self-driving cars from scratch, without steering wheels, accelerator or brake pedals. These will likely be built per Google’s instructions by its manufacturing partner, the Detroit engineering firm Roush. Apparently, Google Auto LLC applied for international vehicle identification number (VIN) codes and closely works with America’s National Highway Traffic Safety Administration (NHTSA) to organize safety tests. The paperwork filed between Google Auto and the NHTS indicates “the cars are rear-wheel drive in design, with each wheel having its own braking system,” says The Guardian. Seeing how it’s a driverless car, it’s mandated by the NHTSA not to exceed 25mph, which is why the cars are powered by modest 20-30kW electric motor from a lithium ion battery. 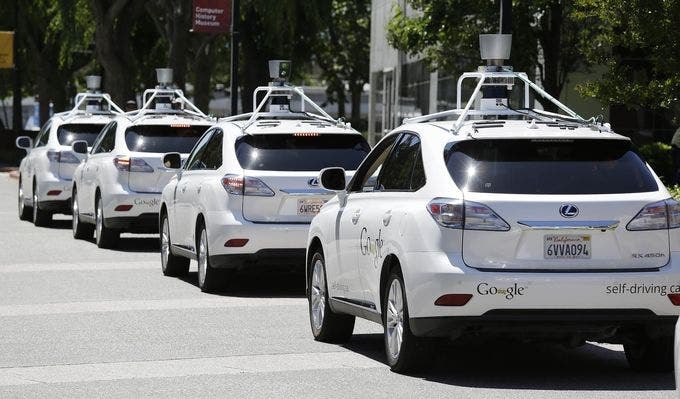 It’s interesting to hear, in any event, that Google is this ambitious with its self-driving car tech. And why shouldn’t they be? After all, self-driving cars might become one of the fastest growing tech in the coming decade, with at as many as 10 million such cars by 2020. The competition is pretty stiff, too. Established auto makers like Mercedes, BMW or Tesla are already experimenting with their own self-driving features. They have the money, the experience and the name to make it work.